Whenever an idea for domain name pops into my head, I usually check GoDaddy’s domain checker tool for the domain name’s availability so that when it’s available and I feel like getting the domain I can go directly to GoDaddy’s domain registration tool. If you’re a GoDaddy customer planning to register a new domain, you might want to try using the new GoDaddy GeoDomainMap tool. 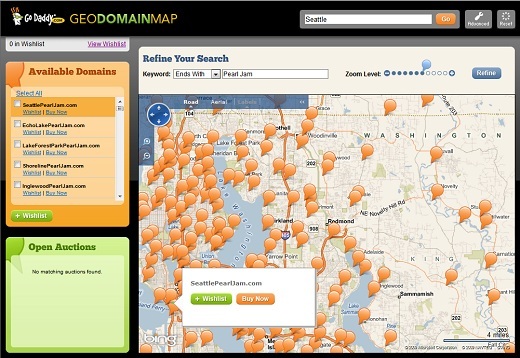 GeoDomainMap uses Microsoft’s Bing Maps in providing a map-based interface for exploring available domain names with location information included in the name. This tool will be most useful if you’re planning to start a location-based fan site or a blog for your local business. The tool works something like this – you type in a location first, then a keyword that you want to use. The GeoMapTool will then search for all the available domains containing the keywords you used appended with the location. The location name is either appended before or after the keyword. If you’re wondering why GoDaddy just return available domain names with associated location, that’s because the GeoDomainMap tool will use this to triangulate the current location and nearby location to represent them on the Bing map. When you hover on the balloon markers displayed on the Bing map, a pop-up will appear showing you some details as well as a link to the GoDaddy domain purchasing page. You can also opt to add the domain name to your wishlist. GeoDomainMap is a pretty cool tool that serves a good purpose. You may try it here.